The Member Benefits Online System (MBOS) is a set of Internet based applications that allow registered retirees and benefit recipients access to their pension and, if applicable, health benefit account information. The Division of Pensions and Benefits has designed MBOS to be both fast and easy to use. Once you begin to use MBOS, we believe you will find it to be one of your most useful resources for getting accurate, up-to-date information about your pension and health benefits. For more information about becoming a registered user of MBOS, see the MBOS Registration Information page. When you first sign onto MBOS you are taken to your MBOS Retiree Home Page. Note: If you have more than one pension account registered with MBOS, you will be presented a screen to select the account you wish to view. The MBOS Home Page displays your information as a retired member, including the current e-mail, mailing address, and phone number on file with the Division of Pensions and Benefits. If any of this information is incorrect, see the detailed instructions provided below on how to submit changes. A Message Board area is included for news and updates of interest to retirees. Also on your MBOS Home Page is the "Retired Account Applications" area. Here you will find buttons for calling up the various online retiree applications. These applications provide information about your pension account and link you to online application forms. Additional information about using these applications is provided in the sections below. Access to MBOS applications is based upon the type of retirement or benefit payment in combination with the benefits provided under your former employer. Therefore, not all applications are available to all retirees. Note: New applications (online forms, etc.) will be added as programming is completed. If, after reading the information in this User's Guide, you still have questions about or difficulty accessing or using MBOS, registered users may contact the Division's MBOS Help Desk at (609) 292-7524 or send an e-mail. Return to your MBOS Home Page to access other MBOS applications. You should always use the "Home" button (instead of the browser's "Back" buttons) to return to your MBOS Home Page. The MBOS Home Page displays your information as a retired member, including the current mailing address, phone number, and e-mail address on file with the Division of Pensions and Benefits. If any of this information is incorrect, click on the highlighted text and a page will open where you can submit changes. Click on the highlighted address or phone number to open the Change of Address page. The Change of Address page displays the current address and provides fields where you can enter changes. Enter your new address and/or telephone information. Then click the "Submit" button. You will be shown a confirmation page verifying the change. Click the "Home" button at the top of the page to return to the Home page. Click on the highlighted e-mail address to open the E-mail change page. The page displays the current e-mail address and provides fields where you can enter the new address. The Retiree Account Information application allows you to view information about your personal retirement account. To access to the application, click the "Retired Account Information" button on your MBOS Home Page. The page that opens will show your current account information. The first section contains member information and information about your date and type of retirement. The second section contains allowance and deduction information about your current retirement payment. The third section contains information about other pension related information, including Direct Deposit status, Cost-of-Living Adjustment information, and - if applicable - Health Benefits information and Pension Loan repayment status. At the top of the Retired Account Information page is a link to a "printable version." where you can print a copy of this information to keep for your records. Click on the "Home" button at the top of the page to exit the application and return to the MBOS Retiree Home Page. The second section of the Retired account Information page contains allowance and deduction information about your current retirement payment. Also provided is a drop-down box where you can select other check dates for viewing. To see the information about another check date, select that date from the drop-down list. A page will open with allowance and deduction information about that check date. When you are done, click the "Return" button to exit and go back to the Retired Account Information page. The Designation of Beneficiary application allows you to review and, if desired, change your designated beneficiary(ies) for payments upon your death for Group Life Insurance — and in some cases Pension account funds. 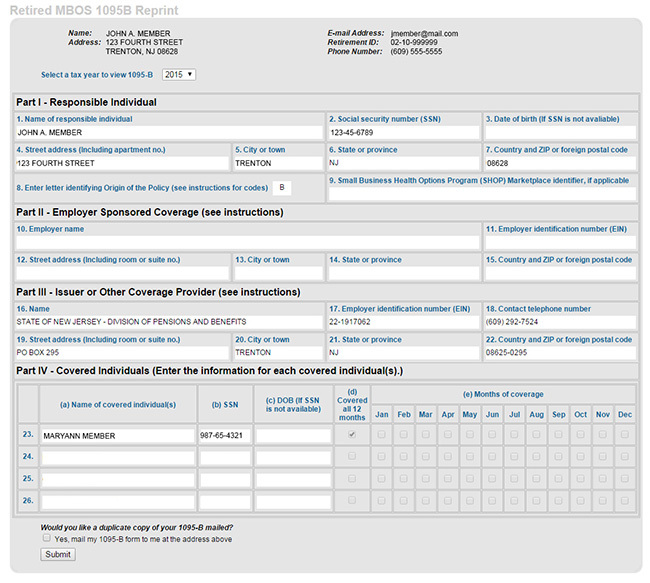 To access the application, click the "Designation of Beneficiary" button on your MBOS Home Page. The beneficiary information on file will be displayed. If you wish to change, add, or modify your beneficiary information, click the "Change Beneficiaries" button. If no beneficiary information is on file, click the "Add Beneficiary" button. A list of beneficiaries will appear, along with options to modify, add, or continue. To add a beneficiary, click the "Add Beneficiary" button. Next, select the beneficiary type - individual or trust, corporation, organization, charity, or estate. Fill out the form that appears with your selection. Once you have completed the form, click "Continue". The information you added will be displayed for verification. Click "Continue" if the information is correct. Click "Modify" to change or delete a beneficiary, and follow the onscreen instructions. If you have deleted a beneficiary, the word "DELETED" will appear on the verification page. Click "Continue" to confirm the deletion. After you have completed any additions, changes, or deletions, you will be presented with a final verification of the beneficiary information on file. If this information is correct, click the "Submit" button to complete the process. A link to a "Printable Version" is on the page. Please print a copy of the final information for your records. Statement and Letter options include Federal Tax Information, State Tax Information, Health Benefits Confirmation, Name Change, Retirement Account Information, Power of Attorney, Retirement Account Information (Third Party), and Power of Attorney (Third Party). The Electronic Funds Transfer (EFT) application allows you to start or change an EFT or direct deposit of your monthly pension payment. To access the application, click the "Electronic Funds Transfer" button on your MBOS Home Page. If you do not have Electronic Funds Transfer currently in effect, the page that opens will ask if you wish to begin a new EFT Authorization. Click the "New EFT Authorization" button to begin the process. If you select a "New EFT" or wish to "Update" your current EFT information, a page will open with form fields and detailed instructions on how to enter your bank information. Please check that the requested information is correct and click the "Continue" button. A Summary page will follow that displays the bank and account information. To make any corrections, click the "Back" button. Otherwise, click the "Submit" button to complete processing of your EFT request. A final confirmation page will be shown. If you wish to terminate an existing EFT, click the "Terminate" button. (Note: Terminating an EFT will end the transfer or direct deposit without changing bank accounts, and you will be mailed a paper check). A Summary page will display the EFT termination request. To cancel or make changes, click the "Back" button. Otherwise, click the "Submit" button to complete processing of your EFT Termination request. A final confirmation page will be shown and your monthly pension payment will be sent as a paper check. The Income Tax Withholding application allows you to start, change, or stop Federal and/or New Jersey State Income tax withholding from your monthly pension payment by submitting a federal Form W-4P (go to details) or State Form NJ W-4P (go to details). To access the application, click the "Income Tax Withholding" button on your MBOS Home Page. The page that opens will show a three year history of any retiree account Federal and New Jersey State withholding. A link to Fact Sheet #12, Taxation of Retirement Benefits, Adobe PDF (45K) is also available to provide additional tax information. To change your withholding, click the button for either the "Federal W-4P" or the "New Jersey State W-4P." Please note: If you live outside New Jersey, you are not required to pay New Jersey income tax on the pension you receive from the retirement system. The Division of Pensions and Benefits does not withhold income tax for other states. Check with your home state's tax office to determine if your pension is taxable in your state of residence. To access the federal Form W-4P, click the "Federal W-4P" button. The page that opens will show your current federal income tax withholding status. Note: IRS regulations require a default withholding status from all new retirement accounts of "Married with 3 allowances" unless/until you change your federal withholding by submitting a Form W-4P. To STOP all federal tax withholding, select the check box to "Stop withholding all federal income tax." A selection list will appear where you must choose a retirement check date to end withholding. After you have selected your check date, click the "View Summary of Changes" button. You will be shown a Summary Page on your changes. Click the "Submit W-4P Form " button to complete the process and view a Confirmation Page for this change. To CHANGE your federal tax withholding amounts, select the check box to "Calculate federal income tax withholding...."
Selection boxes will appear where you must indicate your Marital Status for tax purposes, the Number of Allowances/Dependents, any Additional Dollar Amount you wish withheld (monthly) for Federal income tax withholding, and an effective date for the retirement check when you want the changes to take effect. When all of the withholding information has been entered, click the "Calculate" button and you will be able to see the total monthly amount to be withheld for federal income tax. If you wish to further change the federal withholding amount. you can re-enter information in the fields and re-click the "Calculate" button until you are satisfied with the result. If you are satisfied with the new withholding calculation. click the "View Summary of Changes" button. The "Federal W-4P Monthly Withholding Summary" page will open. Please check that the information shown is what you wish withheld monthly for federal income tax. If you wish to make changes, click the "Make Additional Changes" button. If the information is correct, click the "Submit W-4P Form" button to complete the process. You will be shown a Confirmation Page that contains a final summary of your selections. There is also a link to go to the New Jersey State Form NJ W-4P if you wish to make changes to your New Jersey State income tax withholding. Otherwise click on the "Home" button at the top of the page to exit the application and return to the MBOS Retiree Home Page. You may not owe New Jersey State income tax on your pension until the total of accumulated pension received is equal to the total amount of pension contributions you made while employed. See Fact Sheet #12, Taxation of Retirement Benefits, or contact the N.J. Division of Taxation for more information. If you live outside New Jersey, you are not required to pay New Jersey income tax on the pension you receive from the retirement system. The Division of Pensions and Benefits does not withhold income tax for other states. Check with your home state's tax office to determine if your pension is taxable in your state of residence. To access the New Jersey State Form NJ W-4P, click the "New Jersey State W-4P" button. Because New Jersey law does not require automatic income tax withholding from your retirement benefit, the first time you enter the New Jersey State Form NJ W-4P application it will show you the page where you can begin withholding. After you have made your selections, click the "View Summary of Changes" button. You will be shown a Summary Page on your changes. Please check that the information shown is correct. To increase or reduce your current New Jersey State withholding amount, click the "New Jersey State W-4P" button. The page that opens will show your current New Jersey State income tax withholding status. You must indicate the effective date for any action by selecting a retirement check date from the drop-down list. There is also a link to go to the federal Form W-4P if you wish to make changes to your federal income tax withholding. The Duplicate 1099-R application allows you to view or request a duplicate Form 1099-R for filing Federal or State income taxes. To access the application, click the "Duplicate 1099-R " button on your MBOS Home Page. The page that opens will show the 1099-R information for the most recent tax year. To see information for a different tax year, select the year from the drop menu. At the top of the page there is a link to a “Printable Version” of the information. You can click this link and print a copy for your records. Click the "Submit" button to complete the duplicate request. Please allow 10 - 14 business days for duplicate processing and post office delivery. To exit the application, click on the "Home" button at the top of the page. To access the application, click the "State Health Benefits Program" or "School Employees Health Benefits Program" button on your MBOS Home Page. You will be presented with a menu of available health benefits resources. Click the "Inquiry" button to review your health benefits coverage status and history. If the "Duplicate 1095B" button is presented, you will be able to view or request a duplicate IRS Form 1095B - the 1095B is only available to non-Medicare eligible retirees. The first screen of Health Benefits Inquiry will present the "Subscriber/Eligibility" page. Select your account by clicking on the "Employer ID" number. To access additional retiree detail, click the "Retiree Information" button when it appears at the top right of the Retiree Eligibility Summary screen. Click here for information about retiree bills. To return to the Retiree Eligibility Summary screen, hit the "Back to Subscriber Information" button at the bottom of the Retiree Information screen. To view the history of your SHBP account, click the link "Click here to view coverage history". To return to the Retiree Eligibility Summary screen, hit the "Back to Subscriber Information" button at the bottom of the Previous Coverage Information page. To access COBRA information (if available), hit the "COBRA Account" button when it appears at the top right side of the Eligibility Summary screen. To access additional COBRA detail, click the "COBRA Information" button when it appears at the top right of the COBRA Eligibility Summary screen. Click here for information about COBRA bills. To return to the Eligibility Summary screen, hit the "Back to Subscriber Information" button at the bottom of the COBRA screen. To view information about your SHBP bill, click on one of the links under "Plan Type." Use the drop down list to select a specific Billing Period. If there is a link in the "Type" column, clicking it will show you additional billing details. To return to the Eligibility Summary screen, hit the "Back to Subscriber Information" button at the bottom of the Service Provider screen. The Form 1095B is an Internal Revenue Service form that verifies your health benefits coverage status under the federal Affordable Care Act. The Division of Pensions & Benefits issues the Form 1095B at the end of each year to retirees who were covered under the Retired Group of the State Health Benefits Program or School Employees' Health Benefits Program. Retirees who are eligible for Medicare do not receive a Form 1095B. The Form 1095C for active employees is issued by the employer. Contact your employer's Benefits Administration for information or to request a duplicate form. Click the "Duplicate 1095B" button to view the form. The Form 1095B lists coverage information that is reported to the Internal Revenue Service and must be verified on your federal income tax return. The information is presented for viewing in the format shown. If you would like to request a duplicate form to be mailed to you, click the check box at the bottom of the form and then the "Submit" button. You will see confirmation of your request. When finished, click the "Home" button to return to your MBOS Home page. The Division of Pensions and Benefits wants MBOS to be a tool that its members find useful and choose to use in their career and financial planning. We have made every effort to make MBOS powerful while also keeping it easy to use. We would like to hear about how you liked using MBOS and welcome your suggestions on how MBOS could be made better for the way you work. We will try - based on the response we receive - to include the features you would like to see in future versions of MBOS. 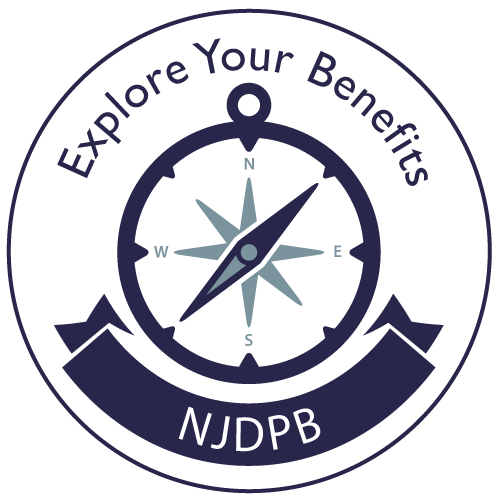 Send your questions, comments, and suggestions to the Division's MBOS development staff at: https://www.state.nj.us/treas/pensions/pensionmail.shtml or you can call the MBOS Help Desk at (609) 292-7524.